The epic horror story of life, death, mummies, and murder is now back as a digital comic series! 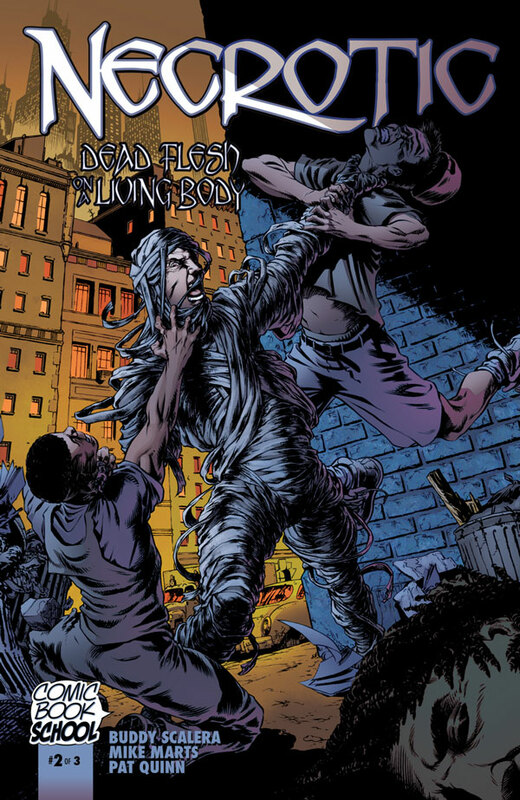 Originally published in 2001, Necrotic: Dead Flesh on a Living Body by Buddy Scalera, Mike Marts, and Pat Quinn is available as a digital comic book. This title is published digitally by Comic Book School. We do not have a print publisher at this time. Digital editions feature all-new covers by Pat Quinn and colorist Nolan Woodard. Necrotic limited-edition print trade paperback available. Read the tragic, romantic tale of a dead man who learns that the only way he can live is as…a horrific mummy. If you like gothic romance with a horror twist, you won’t want to miss this epic comic book story about Marshall Vandergott, a reborn mummy. Fans of gothic classic Hammer Horror films will like this comic book series, available digitally on your tablet. This story was originally published as a graphic novel by After Hours Press in 2001 and has been out of print for over 15 years. Includes two never-before seen “lost pages” that were not included in the original 64-page graphic novel. Check out early work by creators who have gone on to work for Marvel Comics, DC Comics, Image, IDW, and other top publishers. Digital production and workflow by letterer, colorist, cartoonist Rus Wooton. Be sure to check out the Mid-Life Crisis behind-the-scenes preview, coming soon from Comic Book School. Necrotic #1 Now available on Comixology and Amazon Kindle.